Perhaps the most significant part of a wedding occurs at under the the four pillars that make up a wedding mandap. These four pillars signify both the parents of the couple, who raised their children to stand on their own two feet and helped them prepare for the biggest day of their life. 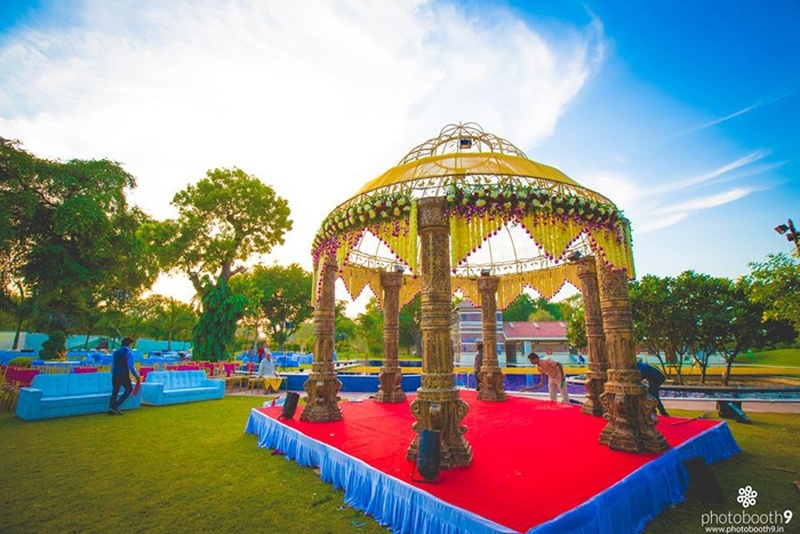 This significance makes the wedding mandap 837 times more special, hence brides and grooms take double, triple even quadruple times the effort in making their mandap as beautiful as could be. We have proof! Scroll down to see twelve of the most stunning wedding mandaps exclusively picked from our Real Weddings, decorated with such exquisite taste and style. Each bringing out the bride and groom’s personalities as well as their culture – Soon-to-be-weds, look close, this is all the inspiration you need to set up your four-pillared beauty. Set up for a beach front day wedding this stunning mandap hued in corals and whites perfectly complemented the calmness and serenity of Amish and Anika’s destination beach wedding. We love how these jasmine flowers hung loosely flow with each gush of wind! The world over knows that reds and golds are synonymous with traditional Indian weddings. Here, Deeksha and Nikhil, opted to go for a mesh inspired mandap, completely made with strings of white jasmine flowers and red roses dangling, adding the perfect accent of red. The ascending gold hued pottery and mandap frame with glistening tea lights were definitely the cherry on this cake! Deepa and Vineet’s complete south-Indian styled wedding demanded a mandap that represented the true essence of their culture, and this couple did it just that way. The four pillars of the mandap were wrapped in fresh banana leaves with strings of white jasmine flowers enveloping it beautifully. Their outdoor mandap had leaf origami made with palm leaves suspended from a jasmine mesh roof – who knew dried palm leaves could be such a beauty?! Minimal flowers, drapes and crystal strings, Johnny and Elya’s wedding mandap was all kinds of classy. Lit up in shades of silver and white that helped the grey drapes glisten perfectly. The cast iron mesh styled roof of the mandap had dangling crystal strings that swayed oh-so-perfectly over this sweet couple. A wedding mandap on water because tying the knot on land is too mainstream? HECK YES! Kapil and Vanshika leveled up their mandap game by taking their Saat Pheras in an all-gold space decorated with red drapes. flowers and dangling gold bells – every photograph taken here was picture perfect! A wedding mandap that was a visual treat of elegance and class amalgamated into one. Karishma and Kunal vowed to be with each other for life under a dome styled mandap that had an abundance of Tuberoses hung gracefully over them. Each string had bunched rose petals on its ends which was the only element of color in this all-white vedi mandap. Ever seen a wedding mandap so gorgeous you had to grab a chair to sit down and absorb all the awesomeness? Probably not, but we can assure you that this yellow-green hued mandap with exquisite white-flower décor is sure to do that! Keval and Kriti got married under a dome styled mandap that had a star cut-out at the top which was beautifully strung with all-white clustered flowers and dangling topiaries filled in with fresh green ferns – this multiple pillared beauty was truly a sight to behold! Marigolds, jasmine and domes seem to be the perfect ingredients in the making of a perfect wedding mandap. Sticking to a specific theme of yellow, green and white, Neeraj and Pooja opted to get married in a dome styled mandap set up indoor. Matte gold ascending pottery was set up in frames to perfectly compliment this tri-colored wedding mandap – classic and beautiful. Crystals strings? Yes. Oversized overhead flower? Yes. Patterned mandap flooring? YES! Every component of Nidhi and Kishan’s wedding mandap was just plain exceptional. We definitely have a special space in our heart for that ginormous flower that hung exquisitely over this stunning couple, and for the flooring too! How often do you see a mandap whose flooring takes your breath away?! Tea-lights and an arched mandap fully covered in flowers make for an amazing space to wed in! Set up against light green drapes with a gold frame, Shefali and Parth’s mandap was exceptional – definitely the kind we’ve never seen before.